Made with chocolate, peanut butter, marshmallow creme and chopped peanuts, this is actually more of a quadruple fantasy fudge—but who's counting? Line 13x9-inch pan with foil, with ends of foil extending over sides of pan. Place 3 cups of the sugar, 3/4 cup (1-1/2 sticks) of the butter and 1 can of the evaporated milk in heavy 3-qt. saucepan. Bring to full rolling boil on medium heat, stirring constantly. Boil 4 min. or until candy thermometer reaches 234°F, stirring constantly to prevent scorching. Remove from heat. Add peanut butter and contents of one of the marshmallow creme jars; stir until completely melted. Add 1 cup of the peanuts and 1 tsp. of the vanilla; mix well. Pour immediately into prepared pan; spread to evenly cover bottom of pan. Set aside. Place remaining 3 cups sugar, the remaining 3/4 cup (1-1/2 sticks) butter and the remaining can of evaporated milk in large heavy saucepan. Bring to full rolling boil on medium heat, stirring constantly. Boil 4 min. or until candy thermometer reaches 234°F, stirring constantly to prevent scorching. Remove from heat. Add chocolate and remaining jar of marshmallow creme; stir until completely melted. Add 1/2 cup of the remaining peanuts and the remaining 1 tsp. vanilla; mix well. Pour immediately over peanut butter fudge layer in pan. Spread to evenly cover peanut butter fudge; sprinkle with remaining 1/2 cup peanuts. Cool at room temperature at least 4 hours before cutting into small pieces to serve. Store in tightly covered container at room temperature. 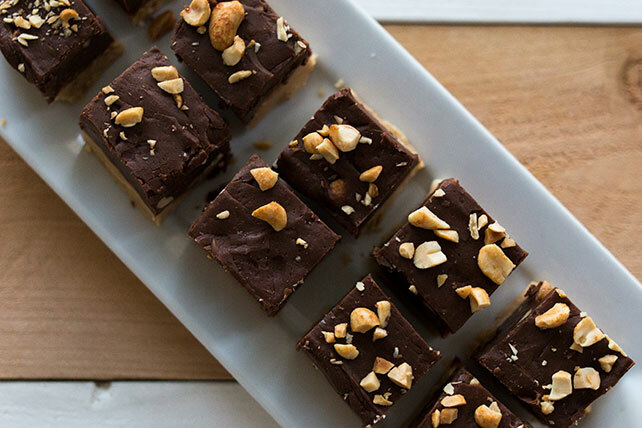 At 70 servings, this decadent fudge is perfect for sharing with friends and family. If you are only able to purchase a large (12-oz.) can of evaporated milk, be sure to use only 2/3 cup for each fudge layer so that the fudge will set. For every 1,000 feet above sea level, decrease final recommended cooking temperature by 2°F. If you don't have a candy thermometer, bring sugar mixture to full rolling boil on medium heat, then begin timing 4 min. while mixture continues to boil, stirring constantly.